This section contains instruction on many of the features related to a Class. Each class page offers a centralized area to house and reference all information related to it. Each class page has its own tabs, buttons, and links. See Class Fields Explained for additional information on the various class detail fields. The Summary tab is where the foundation of a class is built. This page is where important settings for a class are created, and it is from this page that search criteria are pulled in class reporting and searching. The Summary page allows the user to customize the class name, location, status, day(s) of class, tuition fee(s), description, session, room, category 1, 2, and 3, gender, minimum / maximum ages, maximum class size, maximum wait list size, registration start date, class start / end dates, class start / end times, class duration. Options are offered for whether the class is available for display on your website class listings tables, whether you allow web registration or portal enrollment. The Attendance tab contains the attendance records for the class. The Drop List tab provides a summary of the drops that have occurred for the class. From this tab, the user can also indicate if the student completed the class. A listing of students who are wait listed for the class is provided here. Refer to the Wait List Enrollments Help section for more detail. Instructors are assigned to a class from the Instructor tab. Jackrabbit allows up to four instructors for each class. Refer to the Staff / Instructor Help section including the Assign Staff / Instructors to Classes article for complete details. The Lesson Plan tab allows a user to enter class lesson plan information. Click the Add Lesson Plan button to add lesson plans to the class. If you have created Master Lesson Plans (using Classes > Master Lesson Plans), you can copy them into a class using the Copy Master Lesson Plan button. See the Create a Master Lesson Plan section for more information. Assign Skills to a class to track student progress on the Skills tab. Refer to the Student Skills/Levels Help section for more detail. The Misc tab allows you to add notes related to the class that you can refer back to. View or print a class roll for the specific class using the Class Roll Button. Multiple Class Rolls may also be printed at one time using Classes > Class Rolls. Additional customization options are also available using Classes > Class Rolls. See the Class Rolls topic for more information. 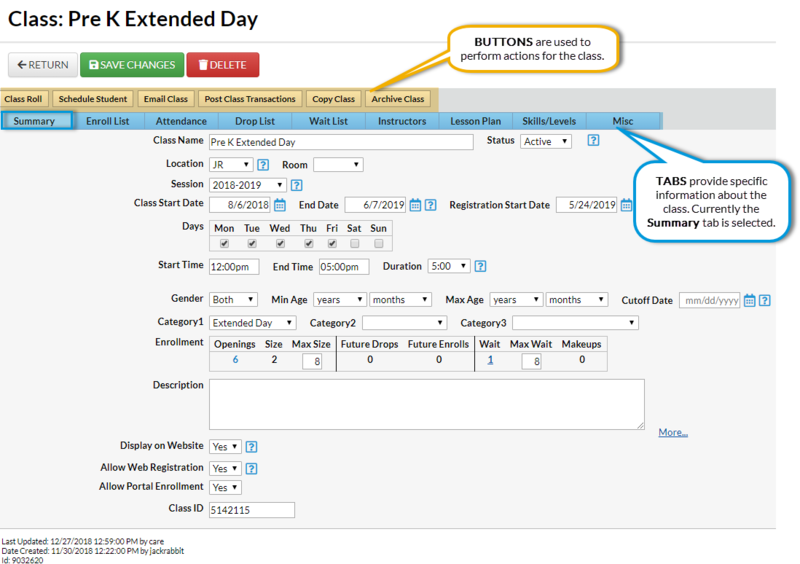 In addition to scheduling a student from the Family page or the Student page, it is also possible to enroll students using the Enroll Students button from the Class page. Refer to the Schedule Students in to Classes (Enroll) Help section for more detail. Click the Email/Text Class button to quickly email or text a specific class. Refer to the Emailing in Jackrabbit or Texting in Jackrabbit Help sections for more information. Jackrabbit offers many options for posting fees, including using the button to post a group fee to a specific class. See Post Class Transactions (Non-Tuition) for additional details. Click the Copy Class button to copy (duplicate) an individual class. This is particularly useful when creating classes that contain similar information and only require a few changes. Classes in your Jackrabbit database are considered Active until they are archived. Classes do not become inactive simply because the Class End Date has passed. Using the Archive Class button archives the specific class. For details on archiving multiple classes at one time, refer to the Archive Classes Help section.